https://matcha-jp.com/en/428 How To Make Tanzaku For Tanabata Festival - Make Your Wishes Come True! How To Make Tanzaku For Tanabata Festival - Make Your Wishes Come True! Tanabata and the custom of hanging tanzaku bring color to areas all across Japan in July and August each year. Learn about what tanzaku are, how to make them yourself, and enjoy the traditional festivities of Tanabata to the fullest! What is Tanabata and What are Tanzaku? Tanabata is a tradition that is a mix of Chinese legends that were brought to Japan in the Nara period, with original Japanese myths. This seasonal festival is celebrated across Japan during either July or August every year. Writing your wish on a tanzaku (small pieces of colored paper) and hanging it on a bamboo stalk on the evening of July 7 is one part of celebrating Tanabata. Hanging tanzaku seems to be custom only in Japan. Much in the way that bamboo grows straight and tall, it was also believed that deities could come down and drive away evil spirits. In earlier Tanabata celebrations, once the festival had ended, these decorations were floated down a river or sent out to see so that the gods could take them away, a similar tradition to toro nagashi. Depending on which calendar a region decides to use, Tanabata festivals may either take place on July 7 (Gregorian calendar), or around August 7 (Lunar calendar). If you miss celebrating it in July, don't worry. Just look for the nearest Tanabata festival taking place in August instead. Continue reading to learn more about tanzaku and how to participate in the traditions of Tanabata. There are special tanzaku sets sold in stores, but tanzaku can also be made easily with items around your home. Fold the paper in half or into thirds and cut along the folds, making sure to leave enough space to write two or three lines of text. Next, punch or cut a small hole for the string, about 1cm away from the top of the paper, in the center. If you are using a thin type of paper, you may want to cover the hole with tape then snip it open once again so that it will be stronger and won't tear easily. This is the most important part. You should write vertically from right to left, and don't forget to write your name at the bottom on the left. This chance comes around only once a year so make sure to write your wish properly! Put the string through the hole. We are using a colorful plastic type this time, but anything will work. If you use a type with wire inside, you can easily tie your tanzaku to the bamboo too. Although it depends on the bamboo, if you are going to be using a regular type of string without metal, then you may want to cut it a little longer. That way, your tanzaku can not only be attached easily but can sway and flutter in the wind, which is part of the charm of these decorations. Hang your tanzaku on the bamboo. Tie it tightly so that it won’t get blown away by the wind. You're done! You're sure to find bamboo with tanzaku at Tanabata festivals and even at shopping centers during this season, where you can write your wish and hang it on the bamboo on the spot. Decorating your own bamboo at home is fun, but adding your wish to the huge displays at a festival site with other people is also exciting. 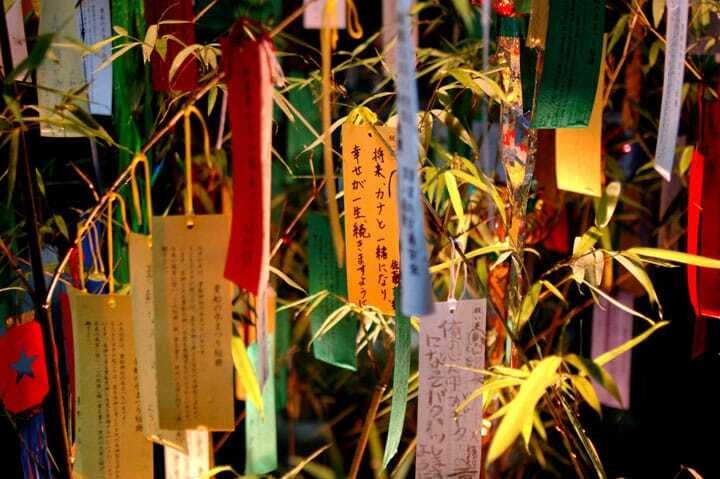 Reading other people’s wishes can be another way to enjoy Tanabata. Enjoy Tanabata and send your tanzaku wish to the shining stars! The Star Festival: 5 Tanabata Celebrations To Check Out In Kanto!